Jan Steen is known for depicting chaotic households, which is unsurprising when you consider that his parents owned and operated a brewery. This painting in particular, much like the painting Netherlandish Proverbs by Pieter Bruegal the Elder, depicts Dutch idioms. The proverbs that Steen chooses to use are all warnings. Though, despite the title, I can’t find the one showing “mo’ money mo’ problems”. Alongside the obvious images of wastefulness and bad parenting, there are also literal depictions of idioms about wastefulness and bad parenting. For example, there is a Dutch saying that goes “the pig runs off with the tap,” which means that people are drinking recklessly. The rose in front of the pig is a remnant of another saying, “throwing roses before the swine,” which is a euphemism for wastefulness. It seems like Steen is trying to cover all of his bases, so no matter how a person chooses to interpret his art, they’ll get the message to tidy up once in a while, make a budget, and for God’s sake call your mother. 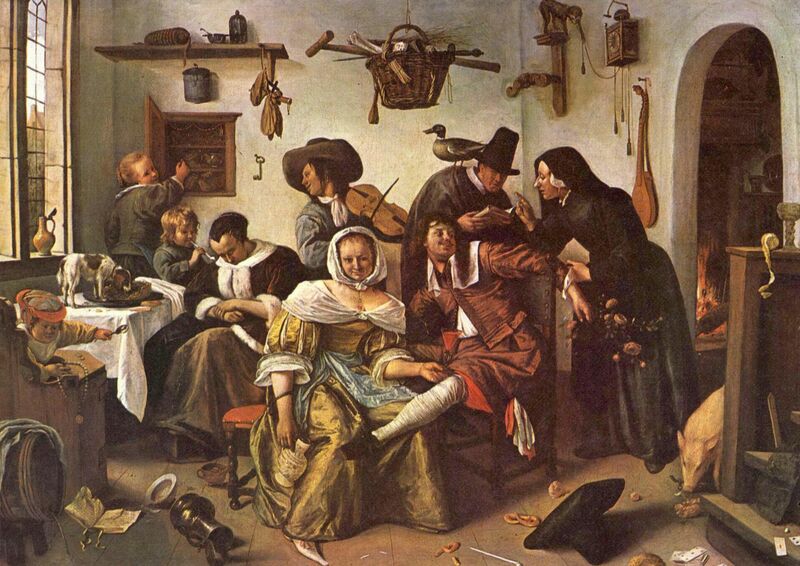 Typical Jan Steen party scene. Lots of stuff hapening that should not be happening in a well ordered household. Mr. Carson would NOT approve. 1) Pigs eating stuff off the floor. 2) Puppy eating stuff of the dining table. 3) Young child smoking a pipe. 4) Another child in high chair about to choke on expensive looking string of pearls. The violin player in the background may be Jan Steen himself. Beware of Luxury is a 1663 work by the Dutch painter Jan Steen, now in the Kunsthistorisches Museum in Vienna. Check out the full Wikipedia article about Beware of Luxury.